These are suggested retail prices for patio cover accessories. Patio covers and awnings need downspouts to run the water out of the gutter and out into the yard or driveway. Commonly used material for downspouts are either the 1 1/2" LS tubes or the 2" x 2 1/4" roll formed downspout. Drops and elbows can be matched to either size of downspout. The last item on this page is the hat section. This could be the most important part of an aluminum awning. It is my opinion that no awning should be without one. The hat section goes across the top of an awning and acts as a stiffener. It can be installed after the awning is complete by using walk boards. The hat section gets attached with screws into the locks of the awning pans. 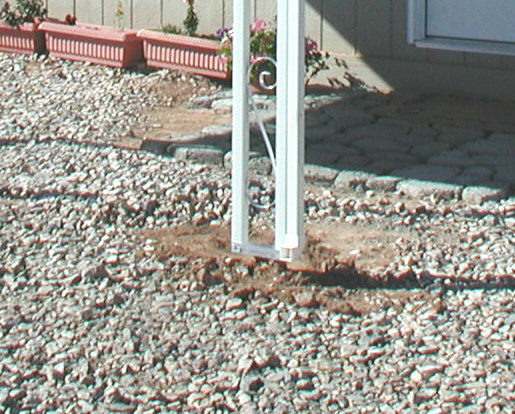 The photo shows a 1 1/2" plastic elbow on a downspout attached to a scroll post. The post is attached to a column bracket and a safety stake.